I can't tell you how often I've driven Edgewood in Old Fourth Ward, but I have never noticed Chrome Yellow Trading Co. on the south side of Edgewood, one block down from Boulevard before you hit Thumbs Up Diner. 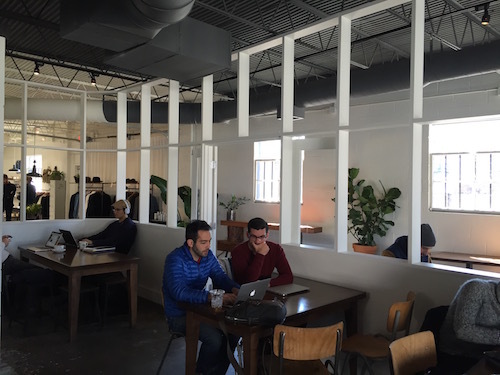 The space is SO great, both welcoming for meetings and quiet enough for individual work. Husband-and-wife duo, Kyle and Kelly Taylor, started Chrome Yellow in the winter of 2013; opening up in short term, pop-up spaces around the city while searching for the right location to put down more permanent roots. 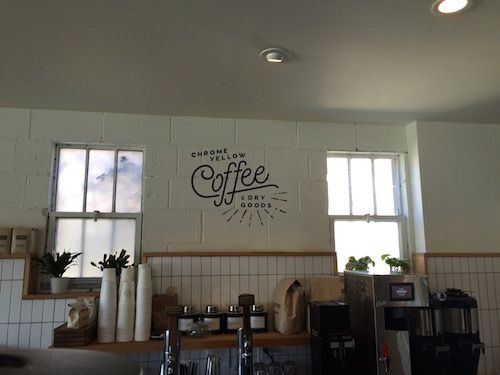 In August of 2015, they opened in the Old Fourth Ward neighborhood of Atlanta with an 1100sqft coffee shop in the front, serving Stumptown Coffee, and another 1000 sqft of space devoted to men and women's clothing in the back of the building. Their goal is to create a calm, aesthetically pleasing space for people to gather and be inspired. Inspired indeed! I, for one, am smitten and can't wait to make this one of my "office" spots.See ya soon Chrome Yellow!! !